The 76ers All-Star point guard bounced back from an underwhelming Game 1 performance, leading the Sixers to victory Monday night. How the Philly fans responded to Ben Simmons, and vice versa, when he played poorly Saturday afternoon has been a notable topic the last few days. Game 2 reminded both parties just how harmonious their relationship can be. At his best, Ben Simmons is a tidal wave rolling towards shore, a freight train screaming down the track, or any other metaphor you choose that exemplifies his preposterous physical tools and electrifying transition speed. At his worst, he’s, well, none of those things. Instead, he’s a source of potential energy that is never fully released, and frustration for a fan base that has come to expect his best. It makes sense, really. Simmons is a walking dichotomy. His best is intoxicating, and is the straw that stirs the Philly offense. His worst, on the other hand, is uninspiring, and feels like a system error. On Monday night, he was unequivocally the former. It was early in the third quarter, and the Sixers were in the midst of a 21-2 run to start the half. The offense was humming, the defense was suffocating, and Simmons was orchestrating. After a Simmons steal and ensuing transition layup (see above), he trotted toward half court, hand cupped to his ear à la Allen Iverson. The TNT broadcast didn’t cut to Iverson—who sat court side with former 76er and fellow Hall of Famer Dikembe Mutumbo—but one can imagine “The Answer” approved. So did the crowd, for that matter. Brooklyn called a timeout and cheers echoed throughout the Wells Fargo Center as Simmons walked towards the bench. This was Simmons at his best, and the Philly fans in attendance let him know it. One thing was for certain: nobody would be booing the Aussie point guard that night. It was quite a turnaround from Game 1, both in terms of Simmons’ performance and the crowd’s reception. 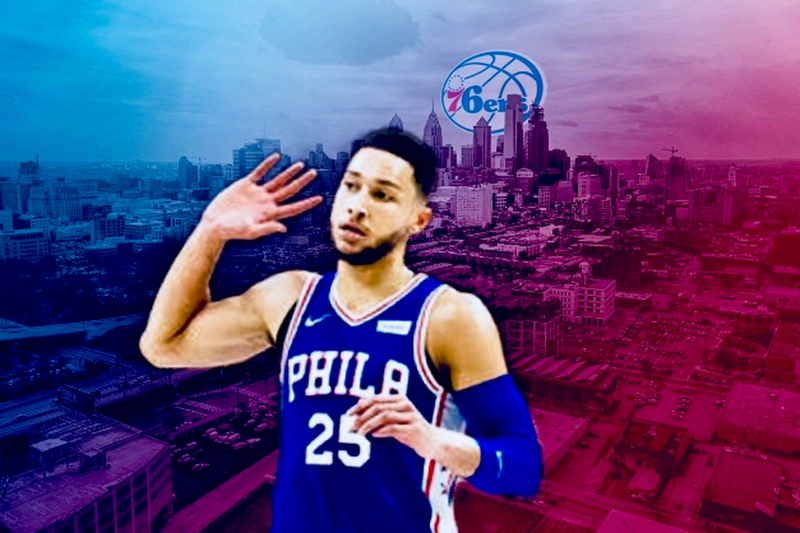 It would be redundant to rehash everything that transpired on Saturday afternoon, so here is a very brief synopsis: the Sixers played poorly, the fans booed them, Simmons took offense to the booing after the game, the fans took to social media, and Simmons walked back his post-game comments ahead of Monday night’s Game 2. It’s Philly. Sometimes, these things happen. “In many ways, Simmons and Philadelphia are a perfect match—though it may not initially appear that way. The City of Brotherly Love has long admired hard-nosed athletes that sport a chip on their shoulder (Brian Dawkins and Allen Iverson, for instance). But above all else, Philadelphians demand a lot from their stars. When things go awry, how will the player respond? Will they wither underneath a barrage of scrutiny? Or will they take it in stride and prepare for the next day? Saturday afternoon was one of the few times the sophomore All-Star has allowed his emotions to seep through his tough exterior when speaking with the media. It was shocking, to say the least. In Philadelphia, two things are true: you are praised when you perform well, and jeered when you come up short. Simmons knows that. He also knows that all will be forgiven if you’re able to bounce back. He bounced back, and then some. Simmons finished with 18 points, 10 rebounds, and 12 assists in 29 minutes, notching his 2nd career playoff triple-double. That is all well and good, but counting stats were not the biggest takeaway from his performance. Rather, it was his attitude that emanated the most. That tone-setting snarl on driving layups and reckless abandon on the offensive glass that his teammates feed off of and fans cheer for. Simmons made it a point to set the tone immediately, and his teammates followed suit. When he is charging downhill in transition, the opposing defense is forced to send help or live with the consequences of trying to stop a 240-pound battering ram. Simmons is a virtuoso facilitator in half-court sets when he is making decisive reads. He is the rare player that can demoralize opposing defenses with a combination of physicality and cerebral court vision. When the two are working in tandem, like they were in Game 2, it changes the entire trajectory of a game. If, hypothetically speaking, this was the first game you ever watched Simmons play, you’d probably have a hard time believing there are games where it is easy to forget he is on the court. Game 1 was one such game, and Sixers fans let him hear it. There are also games where Simmons’ impact can be felt every minute he’s on the floor. Game 2 was one such game, and Sixers fans let him hear it. The Simmons experience can feel like a roller coaster at times. The highs are mesmerizing, but the lows are demoralizing. This is the case with most young players. However, unlike most young players, Simmons has been asked to grow up at an accelerated pace. The Sixers are in win-now mode, and so are the fans. On Monday night, they reminded their young star how much they appreciate him. When they boo, like they did Saturday afternoon, they’re reminding Simmons how much they expect from him. If you perform, they’ll cheer. If you come up short, they’ll boo. That’s how Philly operates. With the win last night, the Sixers guaranteed a Game 5 back at the Wells Fargo Center. If Simmons performs like he did Monday night, there won’t be a reason to boo. Game 4: The Sixers have all the momentum, now all they have to do is keep it Can the Sixers head back home with a 3-1 series lead?